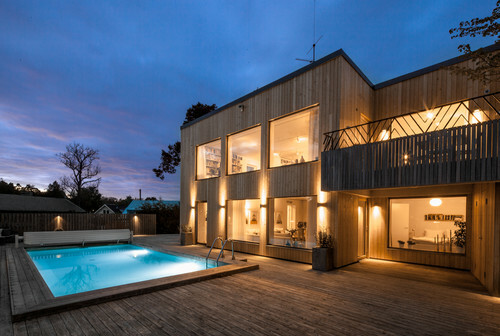 If you're going to own a swimming pool in a Nordic nation, you may as well do it with style. 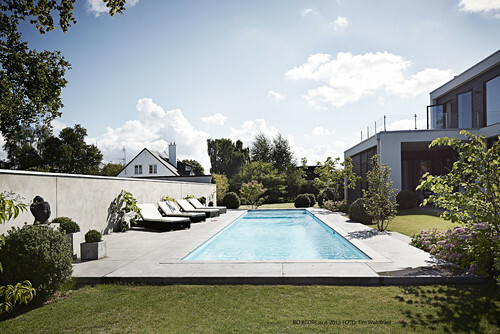 Houzz.se editor in chief Sara Norrman takes a look at some of Scandinavia's most striking pools. Having a swimming pool in a northern climate may seem like a major luxury, but in recent years it has become more and more common to invest in one. Some architects are now taking pools into consideration when drawing up their floor plan, while others look to integrate them into the garden. Whether you're thinking of building a private pool, or are simply fantasizing about taking a dip in 23-degree water while others shiver in the sea and lakes, Houzz.se have pulled together some inspiring examples. Check out the gallery of beautiful swimming pools below. Neither Sweden, Norway or Denmark are known for their steady summer heat, but once it finally hits, a Nordic summer is absolutely stunning. 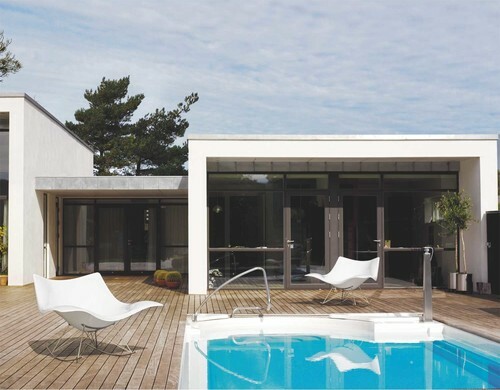 In typical Danish fashion, the villa below has refused to ignore beautiful design, and instead moved Thomas Pedersen's iconic Stingray chair out to the pool. The Swedish pool below, meanwhile, has the perfect combination of a seaside view from the comfort of warmer water. The firm Architecture by Lofti built this wonderful pool in Skåne in a way that family and friends could gather around it. The paving around the pool provides space for sun loungers, while the wall creates a beautiful sun-trap. Some scattered statues of Buddha and a pared-down garden gives the pool a kind of an exotic flair. In the splendid Villa Midgard in Stockholm, DAP architects were very keen to make the pool a natural part of their project. The result is below, with a facade covered in weathering steel, which will get rusty and stained with time and perfectly matches the deep green colour of the pool. With the right kind of light reflecting off a facade, pools can also look beautiful in the evening. 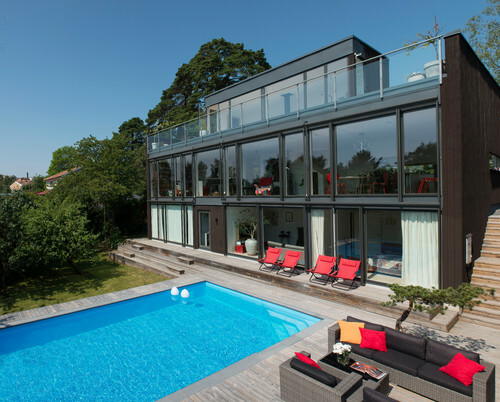 The below house is located in Duvnäs, Stockholm. In this villa in Rönninge, entrepreneur Elithus had to blast into the bedrock to achieve the right, floating feeling. Because of the chilly climate, the pool is only in use during the summer months, but when the weather is right the resident family often goes for a swim. The pool is made of concrete, while the deck is made of larch wood. Since the pool is located high above the ground, the family can feel like they are floating among the treetops during swims. These home-owners wanted to modernize their 60s house, located at Solrød Strand, south of Copenhagen. Taking inspiration from their travels abroad, the owners wanted to create a pool area that was quiet and transparent. At the same time, they also wanted to hold on to the home's original style, combining classic 60s Danish architecture with influences from southern California and Miami. 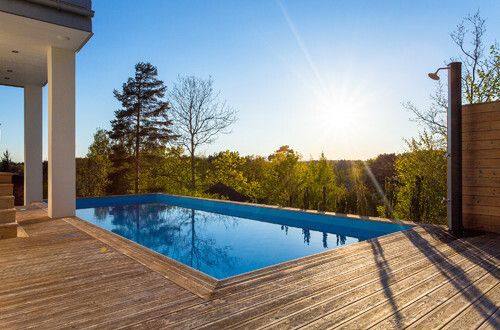 This Vaxholm paradise pool with a wooden deck allows guests to hang out by the water. On particularly sunny days, an awning unfolds and provides shade for the seats along the wall. 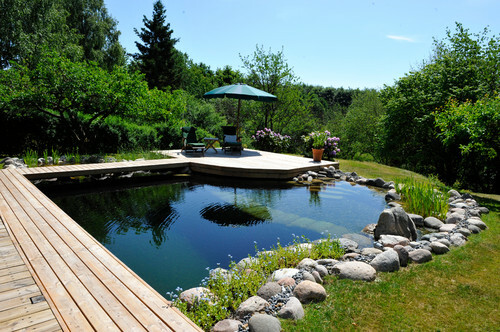 If you want a more natural feel in the garden, this Danish 'swimming lake' (svømmesøn) may inspire. Less chemicals are used in the more natural pool, helping it to integrate into the garden and the surroundings. With its magical water mirror look, it somehow feels more Nordic than traditional azure blue pools. Why swim in the ocean when you can swim above it? 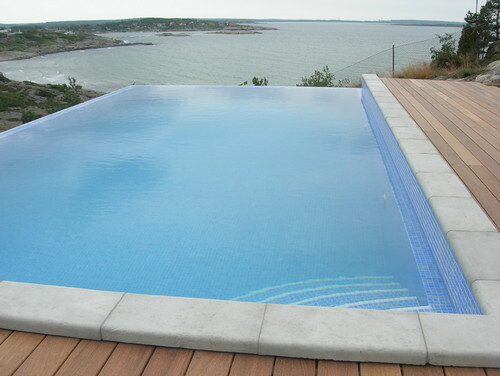 In this awesome infinity pool in the Gothenburg area, you can enjoy the view while staying warm and comfortable. The pool and the large attached deck took three months to complete, following digging and blasting to prepare the foundations. 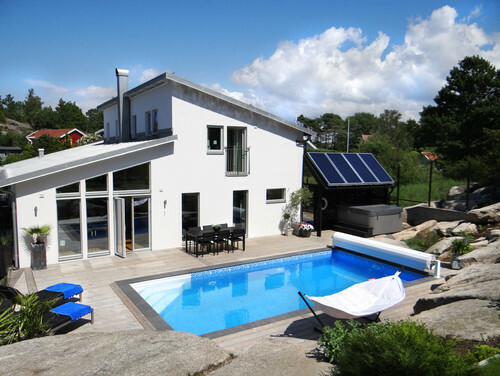 The beautiful flat rocks around this house in Stockholm give the pool a coastal feel. This kind of steep and rocky landscape can be difficult to adapt for a garden, but the wooden deck works nicely with a swimming pool or a hot tub.